Restylane is the first and only cosmetic dermal filler made of non-animal-based hyaluronic acid. Hyaluronic acid is a natural substance that already exists in the human body and is used to provide volume and fullness to the skin. The hyaluronic acid in Restylane is a crystal-clear gel called NASHATM, or Non-Animal Stabilized Hyaluronic Acid. NASHA is biodegradable and completely biocompatible with human hyaluronic acid. Unlike other hyaluronic acid-based products, such as those made from rooster combs, Restylane is non-animal-based. This quality virtually eliminates any risk of animal-based disease transmission or allergic reaction. Restylane is injected directly into the skin in tiny amounts by an ultra-fine needle, resulting in minimal discomfort. The procedure is simple and convenient, and results are practically instantaneous. To optimize your comfort during the short procedure, your physician may anesthetize the treatment area. Both procedures require no pre-testing, but you should take a few precautions before being treated. Avoid using aspirin, non-steroidal anti-inflammatory medication, St. John’s or high doses of Vitamin E supplements prior to treatment, because these may increase bruising or bleeding at the injection site. Also, if you have previously suffered from facial cold sores, there is a risk that the needle punctures could contribute to another recurrence. Restylane lasts twice as long as collagen, so treatments are typically scheduled twice a year. Evidence shows that having a touch-up treatment before the product has fully dissipated will enhance the lasting effect. 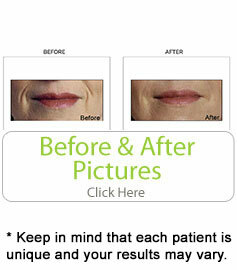 The Restylane family of products includes Restylane and Perlane. Both are cosmetic dermal fillers that are FDA-approved to treat moderate to severe wrinkles and folds. The hyaluronic acid in both products has been modified slightly to last longer than the body’s hyaluronic acid. In the human body it provides volume and fullness to the skin. The difference is in the gel particle size. Perlane particles are larger and designed for deeper injections than Restylane. Dr. Salomon will decide which product is right for you based on an evaluation of facial wrinkles and folds. Restylane last about 6 months and Perlane last up to 9 months.